Westringia ‘Poorinda Pavane’ is a spreading shrub that reaches a height of two metres in our garden. Leaves are in whorls of four, up to two centimetres long, mid green above and white-hairy beneath. The foliage is dense and provides safe nesting sites for small native birds. 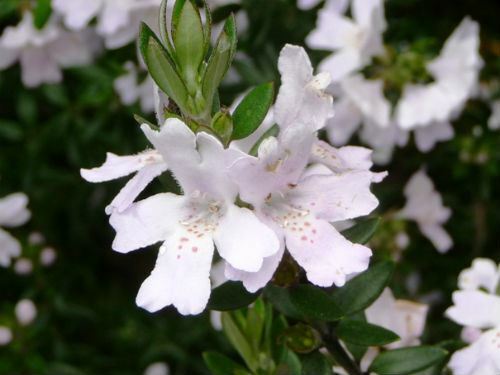 The flowers are about 1.5 centimetres across, pale lilac with an orange-dotted white centre. Blooms are both conspicuous and profuse. Peak flowering occurs from September to November. Our plants also carry a few flowers at other times. Westringia ‘Poorinda Pavane’ is a hybrid whose parents are Westringia fruticosa and a form of Westringia glabra. This is one of many native hybrids developed by Leo Hodge on his property, Poorinda in Victoria (see our article about Leo). In our cold climate garden “Poorinda Pavane” has proved to be hardy, fast growing and free flowering. Plants appreciate an occasional light pruning. We purchased the original plant some years ago and since then have not seen this hybrid in nurseries.